That’s why the alarmist establishment is currently trying destroy her. Crockford’s rebuttal is epic and can be read in full here. Now, the New York Times has weighed in with a piece entitled ‘Climate Change Denialists Say Polar Bears Are Fine. Scientists Are Pushing Back’. The headline has been poorly subbed. “Scientists” should be in danger quotation marks. Yep, the “furry, button-nosed” and “charismatic” are dead giveaways. This is not an article remotely interested in the actual species Ursus maritimus, only the fantasy creature that appears in David Attenborough documentaries and the like in order to serve one overriding purpose: to act as the cute, fluffy, white ursine harbinger of man-made climate doom. The reality is rather different, as Dr Crockford, a Canadian zoologist and polar bear expert, summarized in a recent paper for the Global Warming Policy Foundation. • Global polar bear numbers have been stable or risen slightly since 2005, despite the fact that summer sea ice since 2007 hit levels not expected until mid-century: the predicted 67% decline in polar bear numbers did not occur. 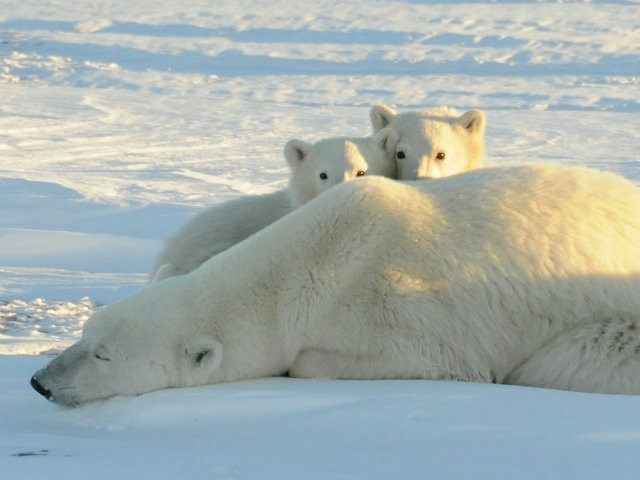 • Abundant prey and adequate sea ice in spring and early summer since 2007 appear to explain why global polar bear numbers have not declined, as might have been expected as a result of low summer sea ice levels. • The greatest change in sea ice habitat since 1979 was experienced by Barents Sea polar bears and the least by those in Southern Hudson Bay, the most southerly region inhabited by bears. • As far as is known, the record low extent of sea ice in March 2017 had no impact on polar bear health or survival. • Some studies show bears are lighter in weight than they were in the 1980s, but none showed an increase in the number of individuals starving to death or too thin to reproduce. • A just-released report of Southern Beaufort Sea bears having difficulty finding prey in 2014– 2016 suggests that the thick ice events that have impacted the region every ten years or so since the 1960s have continued despite reduced summer sea ice. • Claims of widespread hybridization of polar bears with grizzlies were disproven by DNA studies. • Overly pessimistic media responses to recent polar bear issues have made heartbreaking news out of scientifically insignificant events, suggesting an attempt is being made to restore the status of this failed global warming icon. Naturally this all went down like a cup of frozen narwhal sick with the climate loons. Hence this current series of very personalized attacks, designed to discredit Crockford’s expertise. They can’t attack Crockford’s science because it’s rock solid. So instead they have resorted to the usual ad hominem. There’s perhaps one person in the world who knows more about polar bears than Crockford: Mitchell “Mitch” Taylor who has been studying polar bears since 1978. It has become a lot more difficult to talk about polar bears since they became an icon for climate change as a cause. The information has become secondary to the mission for a number of people who were formerly chiefly concerned with research and management of polar bears. The mission is nothing less than saving the planet by saving the polar bears, and ironically the biggest obstacle to this initiative has been the polar bears themselves. The real story has been the extent to which polar bears have managed to mitigate the demographic effects of sea ice loss so far. In retrospect this is perhaps not so surprising because polar bears have been around since the Pliocene which means they have persisted through not only glacial cycles, but also through all the natural climate cycles during the glacial periods and interglacial periods. Did Susan misrepresent the predictions from Amstrup’s “Belief Network”? Has she misunderstood the population estimates provided by the various technical committees and specialists groups? That is easy to check, because these paper are published. They are part of the record. I have been active in polar bears since 1978. I didn’t recognize 12 of the 14 names on the paper written criticizing Susan for publishing an article about polar bears because she does not have any direct experience in polar bear research or management. Does anyone need to point out how hypocritical this is? Since when does anyone need to tag a polar bear to compare what was predicted to what has happened, based on published information? It is also germane that the IUCN Redbook authority was unwilling to continue listing polar bears as a “vulnerable” species based on current population estimates and Amstrup’s Bayesian Network model expectations. This was somehow not mentioned in the article criticizing Susan. Polar bears remain an IUCN “vulnerable” species, but now that is based on a Polar Bear Specialist Group (PBSG) polar bear population model that is driven by speculation but is also presented as “expert” predictive. The new guarantees that polar bears will decline was achieved by decoupling the model population projections from climate model forecasts of sea ice conditions … and just using the time-series regression of sea ice decline since 1980 to forecast sea ice (index for polar bear carrying capacity) forward. And the IUCN went for it. There is an International Agreement for the Conservation of Polar Bears, and occasionally the parties to that Agreement (USA, Canada, Denmark-Greenland, Norway, and Russia) have a formal meeting. The signatory nations (parties) have no independent scientific advisors, and they take their information only from the IUCN/SSC Polar Bear Specialists Group (PBSG). If you don’t believe that climate science is settled, you can’t be a member of the PBSG, even if you started working on polar bears in 1978. Susan is also not a member. There are two ways to get a scientific consensus. One is to present the data and the analysis in a manner that is so persuasive that everyone is convinced. The other way is to exclude or marginalize anyone who does not agree. This occurs so commonly now that it has become an accepted practice. The practice of science has become secondary to governments, NGOs, journals, and scientists who feel that the ends justify the means. The response to Susan’s work is politically motivated, not an argument against her conclusions. The journal’s response to this article and to her complaint was also political. Sadly, BioScience not a credible scientific journal anymore. We have fake news and fake science. Is it really so difficult to see what the Amstup predictions were indexed to, to see if that index has changed, and see if the demographic data are consistent with Amstrup’s predictions or not? Susan has already done the work to show that the polar bear demographic data and sea ice data (all collected and reported by others) do not support the Amstrup et al. (2007) predictions. If you can’t refute the argument, the only thing left is to discredit the author. Where did they get their funding? How many bears have they tagged? Are they in the club or not? … and if not in the club, what the hell are they doing voicing an opinion. How are right-thinking good people like us going to maintain the impression of omnipotent knowledge and scientific consensus if people like Susan are allowed to hold us accountable for what we publish? Bad enough that the IUCN won’t do as its told, at least not without a new crystal ball. There are currently some valid indications that some polar bear subpopulations may be experiencing demographic impacts from reduced sea ice. There are also methodology issues and high variance associated with those studies. Much of the past work has become dated and much of the population work in the last decade is either agenda driven and unreliable, or compromised by data collection issues to the point that accurate population demography estimates are not possible. However, there are also many new studies that report their findings objectively. So just because some researchers and journals have lost perspective does not mean polar bears are not currently impacted by sea ice decline or never will be. To me the loss of credible information is the real harm that has resulted from turning scientific inquiry into an agenda driven exercise … even for a good cause. Some may see parallels within climate science world to the polar bear experience. There are a number of crimes which have been committed by the climate alarmist establishment. Not the least of these is the damage these charlatans, cheats and bullies have done to the integrity of science and scientists.